WELCOME TO THE CURRENT & COMPLETED PROJECTS PAGE !!! 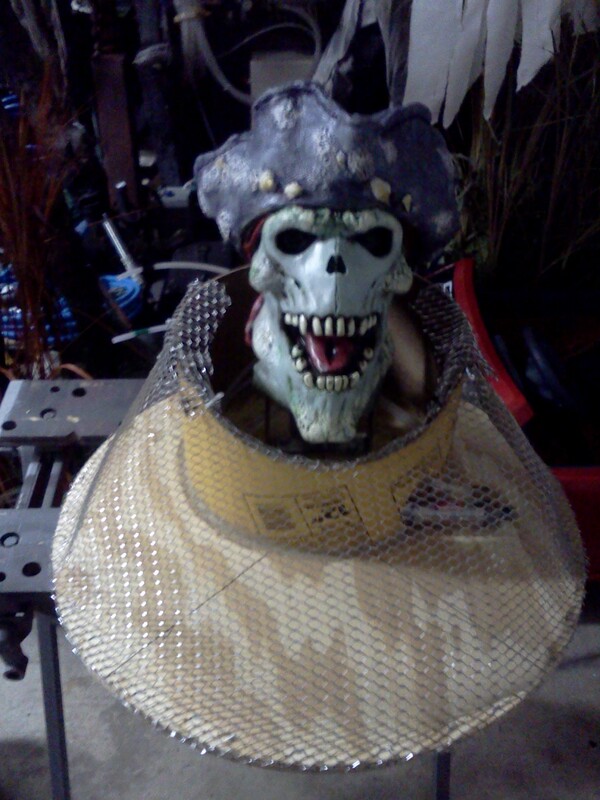 This is a pneumatic animatronic head of a pirate. 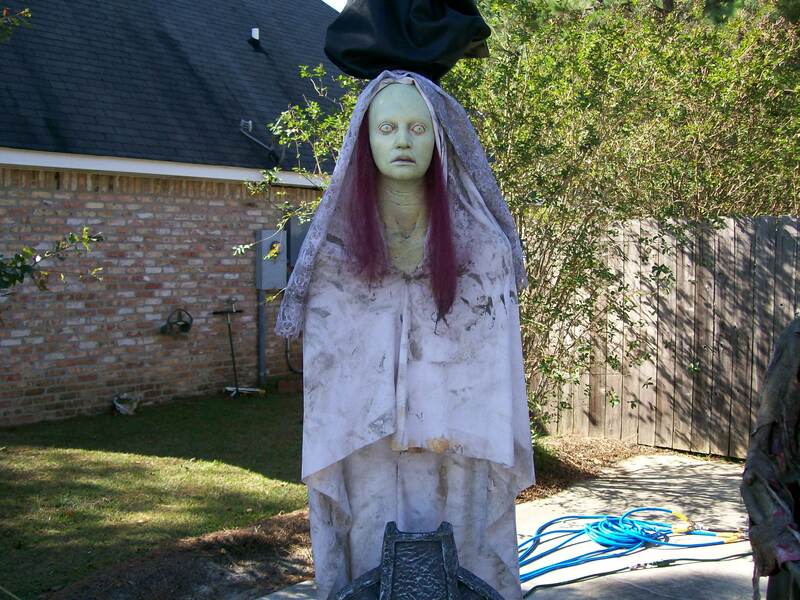 The head was a store bought unit, gutted to use the latex and structure only. 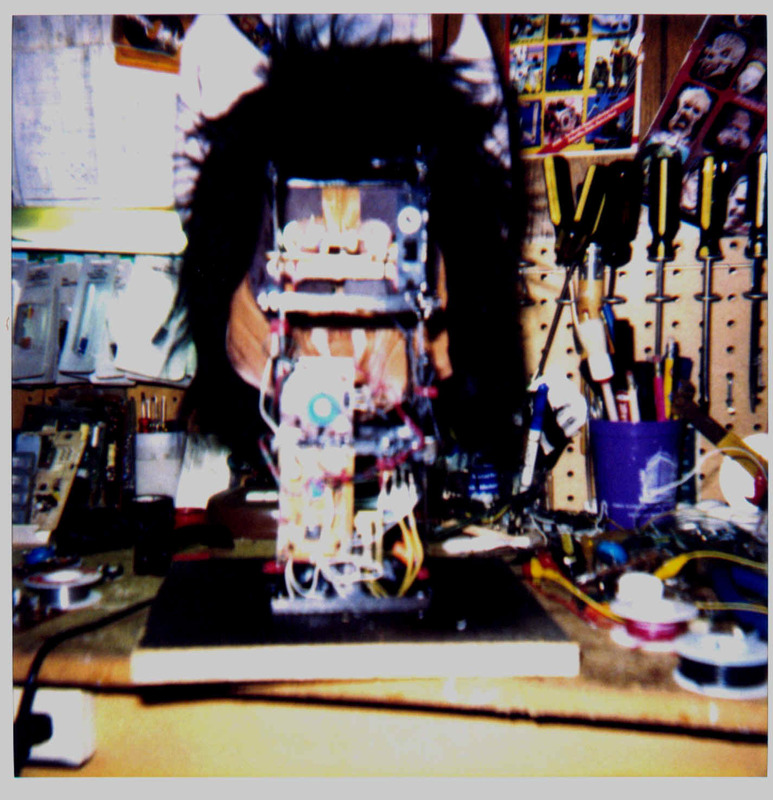 The head is on a two axis movement mechanism controlled by pneumatics. 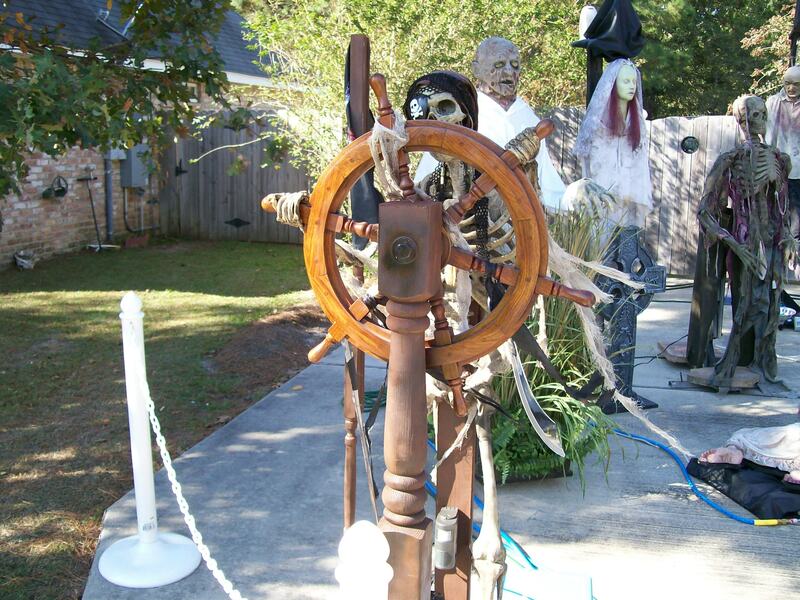 The head is programmed to look up/down, left and right, speaking "pirate-ese". Audio is controlled by CD, and movements are programmed digital logic controller. 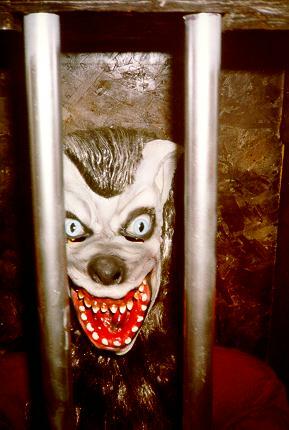 This is a pneumatic animatronic which exhibits a "thrashing" like movement front to back and side to side.. It is digitally control with on-board sound, giving a startling effect either by manual control or cyclic timing. Fully automated Talking Totem Pole features mouth movements synched to ANY audio you feed it. With onboard audio-to-mechanical conversion, this totem pole can be used in a variety of environments. His eyes are "roving" blasts of light creating an effect of white flames. Complete with CD player, audio input for a microphone, amplified speaker, and all pneumatics. This scene contains 8 pneumatically controlled animations. It's accordian-like design allows the set's walls to fold for easy storage. 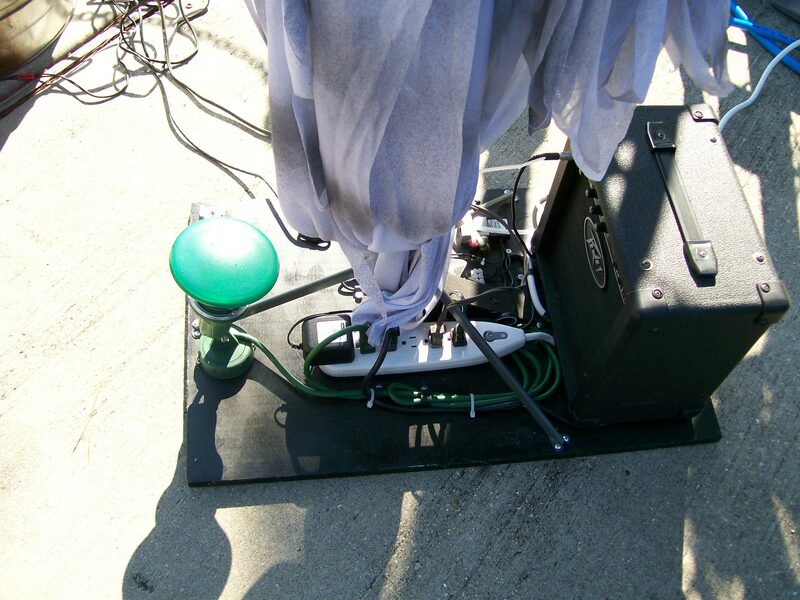 There is a pneumatic chair the "candy-giver" can control which rises 6 feet high. 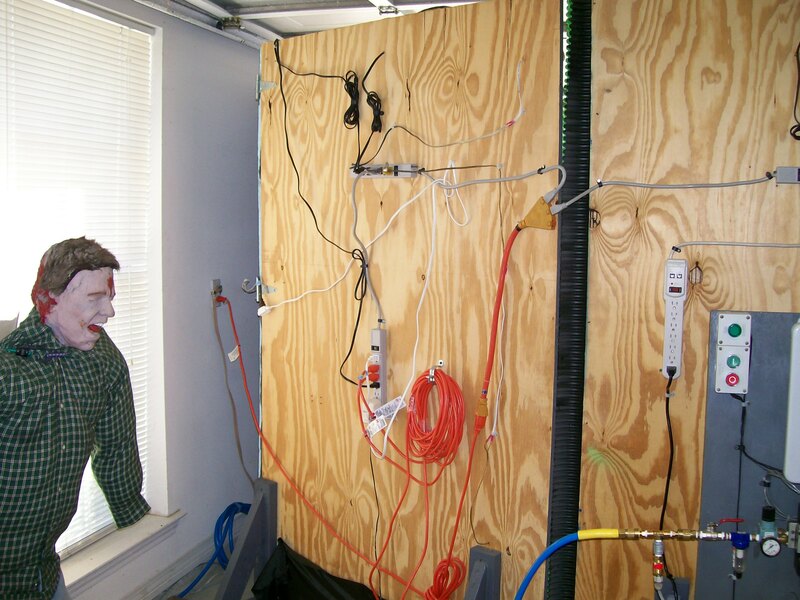 The entire scene is controlled with an 8 channel PLC. 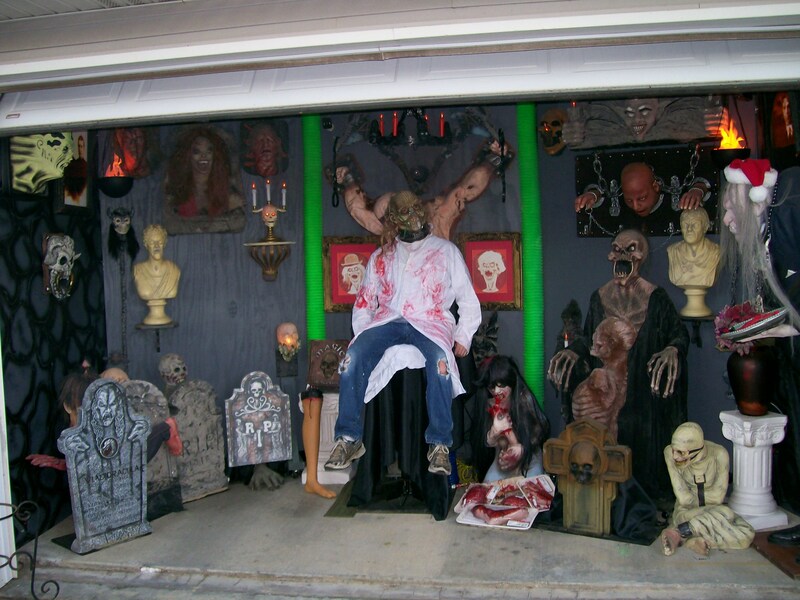 It's designed to be installed and displayed in any home garage. Inquire at craig@craigsrobotics.com for purchase information. This animation is a pneumatic driven showpiece, and comes complete with audio "Yo ho Yo ho a Pirates Lie for me" lyrics programmed into a repeating sound unit activated by motion. The pirate steers the ships wheel back and forth, and when guests approach him, he begins his rant of the "Pirates of the Caribbean" speech. This animation is a pneumatic driven prop which moves in an arc-like manner from a horizontal to vertical position - sideways.. 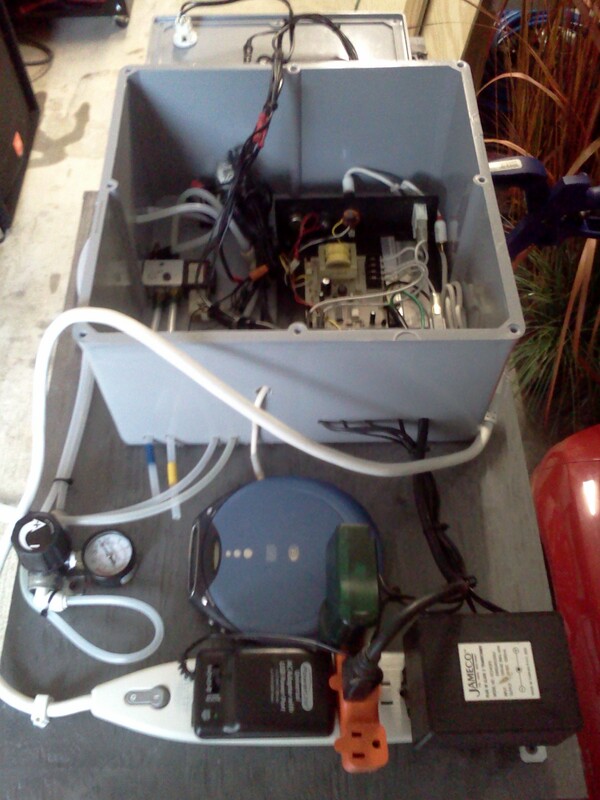 Controlled by an industrial cycle timer, and is a weather resistant prop. This animation is a pneumatic driven, 4 bar linkage. 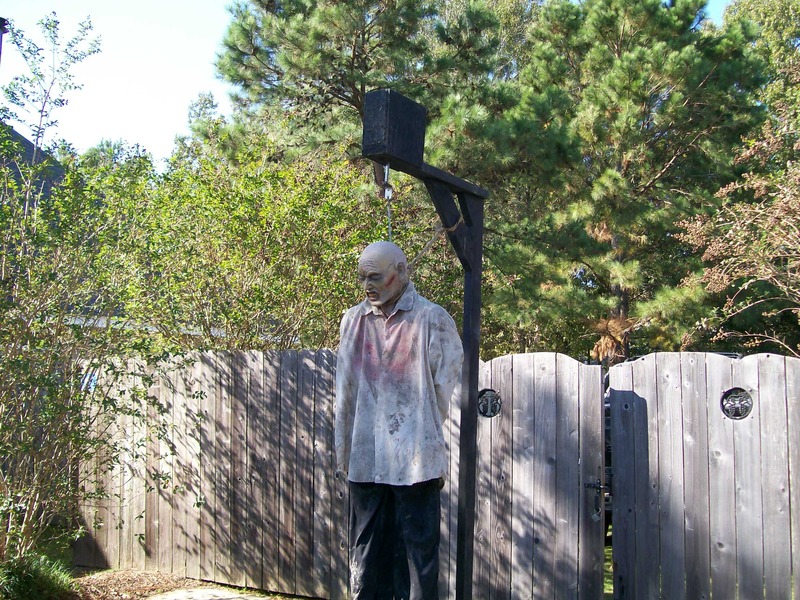 Controlled by an industrial cycle timer, it stands at rest approximately 6 feet, and when activated, pops upward at a slight angle to about 10 feet. 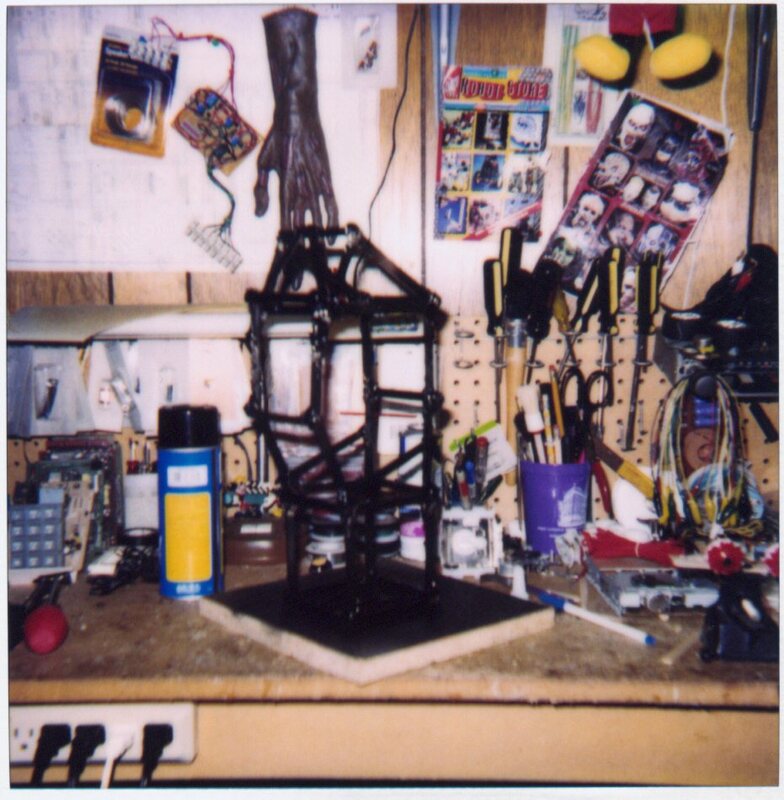 Very heavy armature and lifesize prop. This animation is a pneumatic driven skelerector. It's unique design allows it to fold into itself down to about 1 foot, then springs upward and outward to about 6 feet. Controlled by industrial pneumatic timer, and cycles once every 20 seconds. 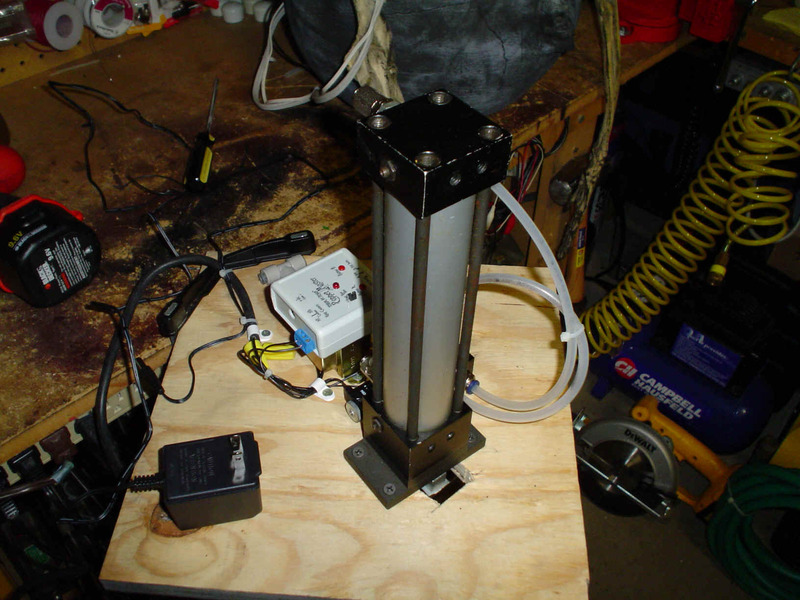 This animation is a pneumatic driven, vertically and horizontally moving prop. It is designed to be hung outside from a tree or suspended from some type of structure. 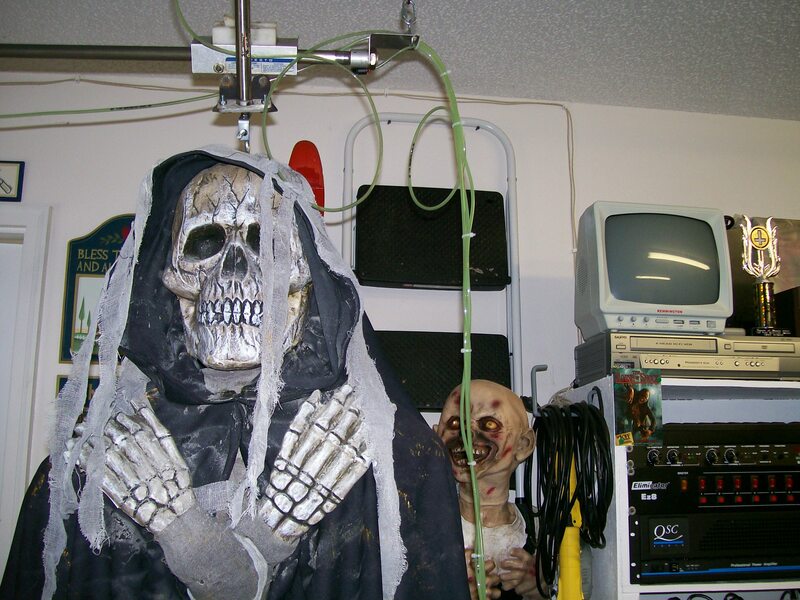 Controlled by an industrial PLC, the reaper floats back and forth and up and down simultaneously, giving the effect of floating in a graveyard. Made from industrial pneumatics. 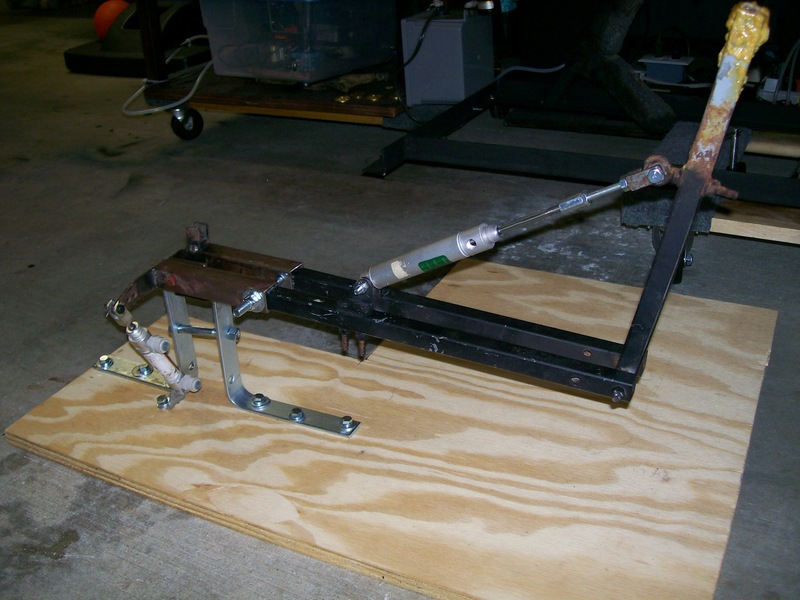 This animation is a pneumatic driven, forward-lunging prop. When activated by pressure mat, the entire garbage can thrusts forward shaking the prop inside. Simultaneously, a loud BANG wails from inside the can, and a screaming buzzer adds to the scare. Controlled by an on/off timer. Simple, but effective. This animation is a pneumatic driven, vertically hung corpse. 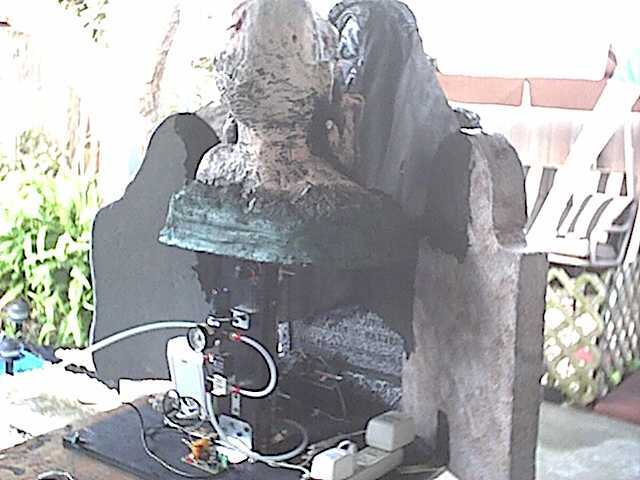 When activated by movement (IR Sensor), it will rise and lower violently from behind a tombstone and emit a shrieking scream. Controlled by a 3 channel industrial PLC. This animation is a pneumatic driven corpse. 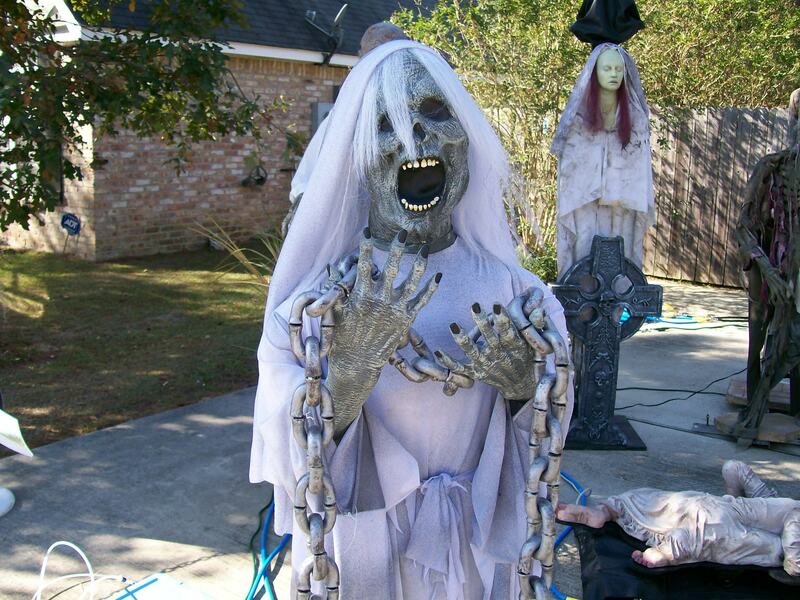 When activated by movement (IR Sensor), her head thrashes violently back and forth to startling screaming effects. 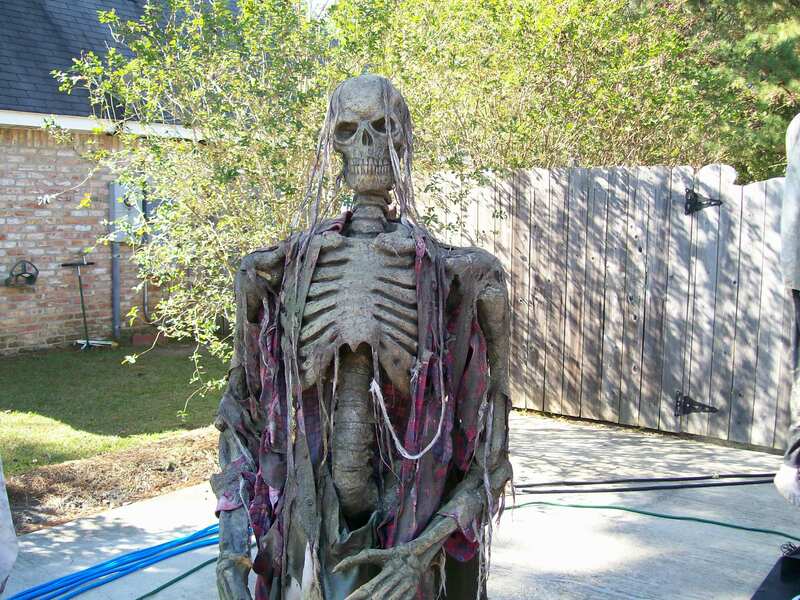 Stands 5 1/2 feet tall with draping gown. This animation is a pneumatic driven corpse. It has 2 degrees of movement: Vertical and rotational. When activated by movement (IR Sensor), it will rise and lower, rotate, and growl, alternating lighting effects between strobe and green light. Controlled by an industrial PLC. 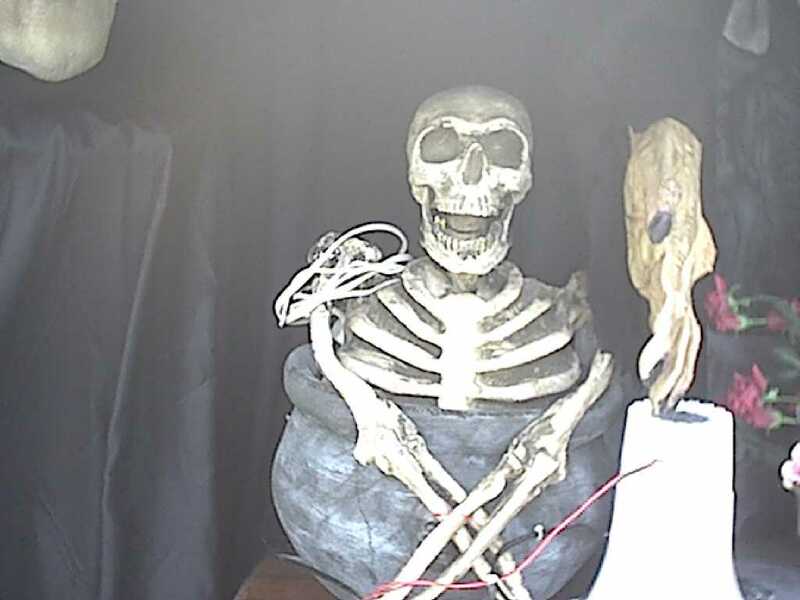 This animation is a pneumatic driven skull. The skull head moves left and right and jaw moves in synch while speaking some verbage from Disney's Haunted Mansion. The eyes flicker and fade into multiple colors. This prop automatically repeats its speech and replays its program every few minutes. Controlled by an industrial PLC. This animation is a pneumatic driven corpse. It has 2 degrees of movement: Vertical and rotational. When activated by movement (IR Sensor), it will rise and lower, rotate, and growl. Controlled by a 3 channel industrial PLC. Want a video of her movement? Click Here .. 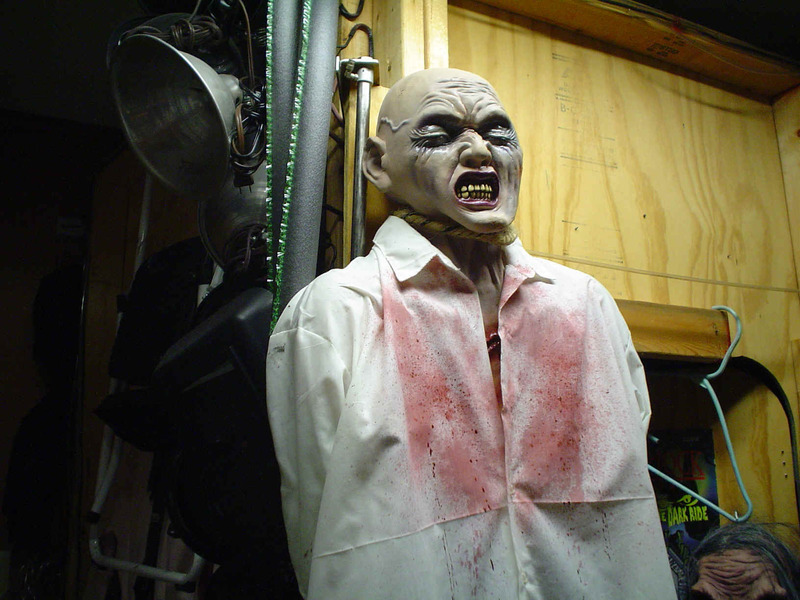 This animation is a pneumatic driven corpse head (The head is foam-filled latex on a wooden stake - we just cut the stake and installed it on our pop-up mechanism). 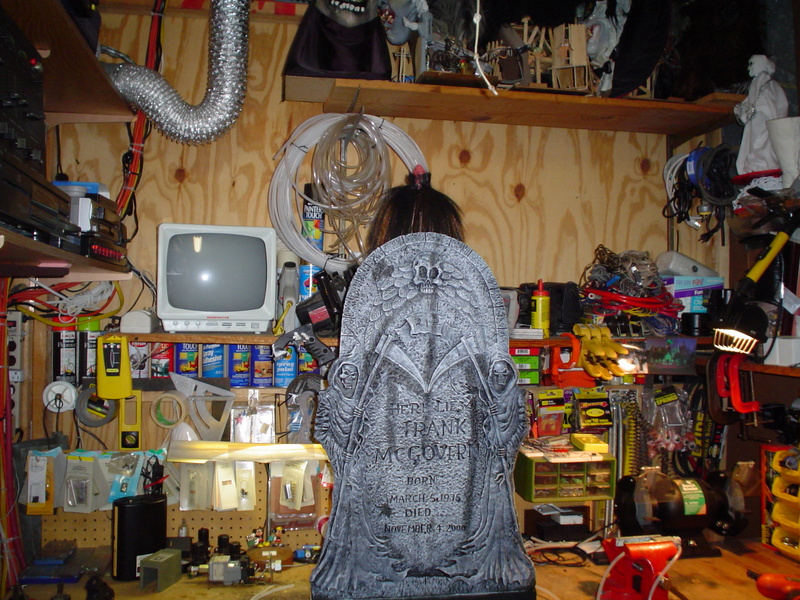 When activated, the head springs upward from behind the hard-foam tombstone and back down. Great graveyard effect. Uses one digital timer for repeat action. Sort of comical more than scary...Timing can be set for fast or slow action. Fresh off of the work bench!!! 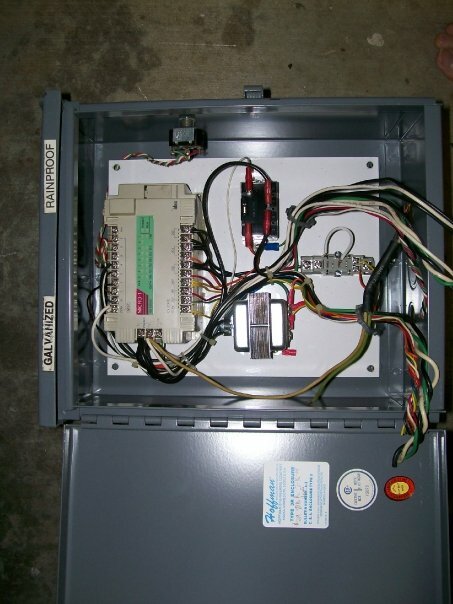 This animation is a pneumatic driven prop controlled by a PLC . When activated, the Zombie bounces randomly up and down thrashing violently. Mounts to a wall with heavy-duty brackets. 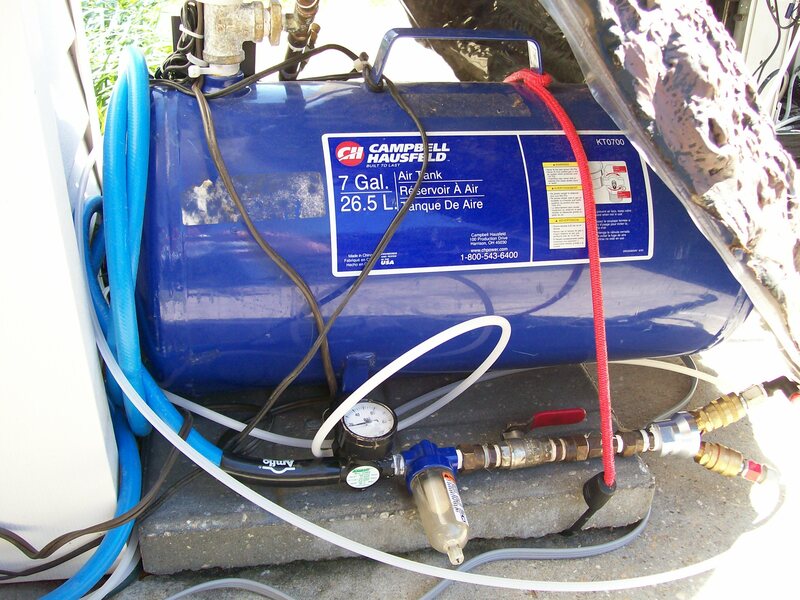 Employs a double-acting, double-bore non-rotational heavy duty air cylinder, and industrial 24v solenoid air valve. 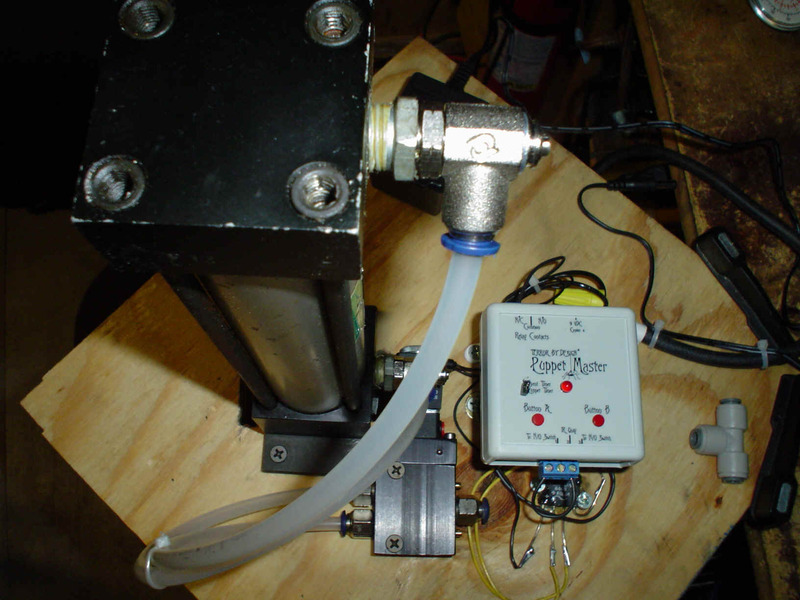 This animation is a pneumatic driven prop controlled by a PLC . 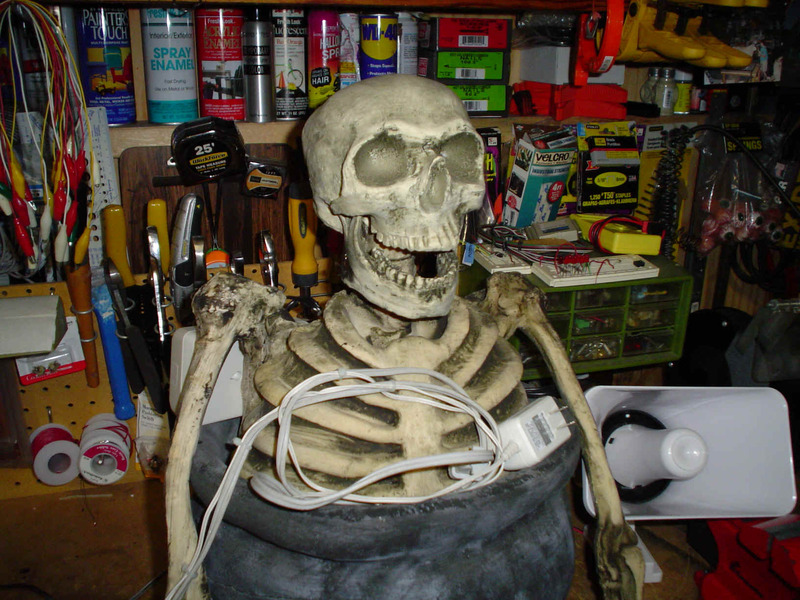 When activated via infrared switch, the Skeleton lets out a loud horrific laugh as patrons approach it. The mouth opens and closes to the laugh, and the head bobs up and down. 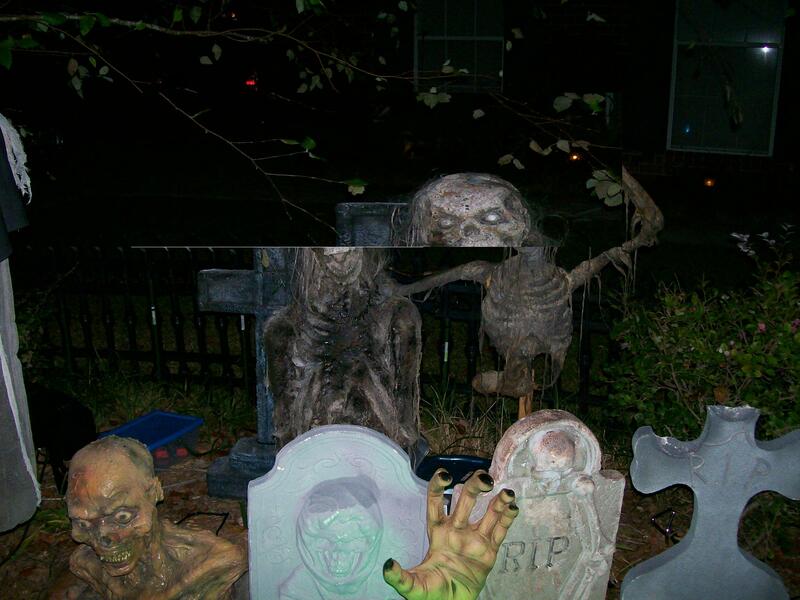 Good background effect for graveyards, front porches, etc. 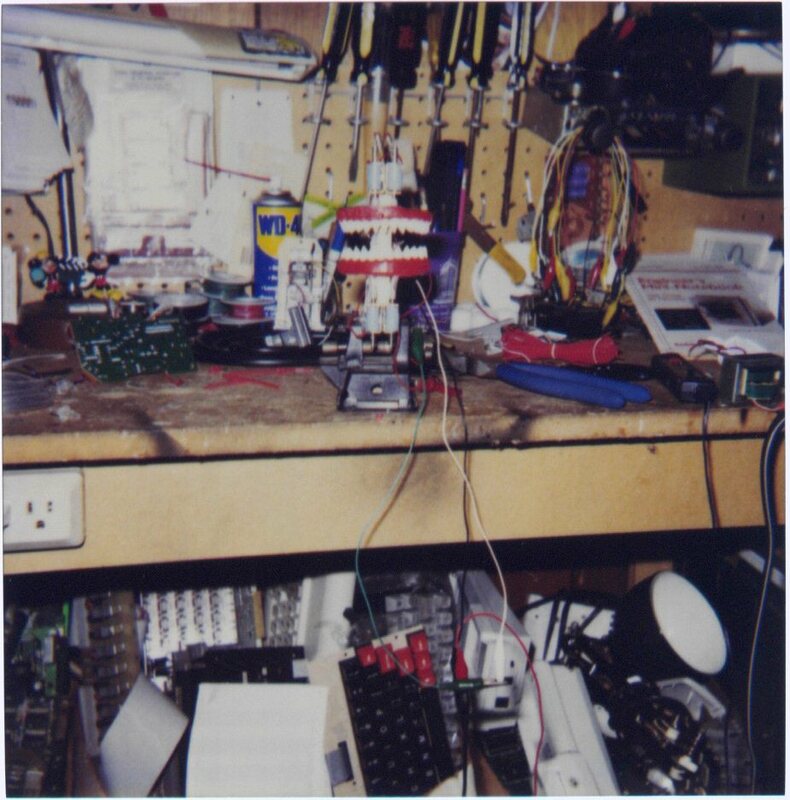 This animation is a pneumatic driven prop controlled by a digital timer. When activated via pressure mat or switch, the hangman will thrash back and forth screaming. 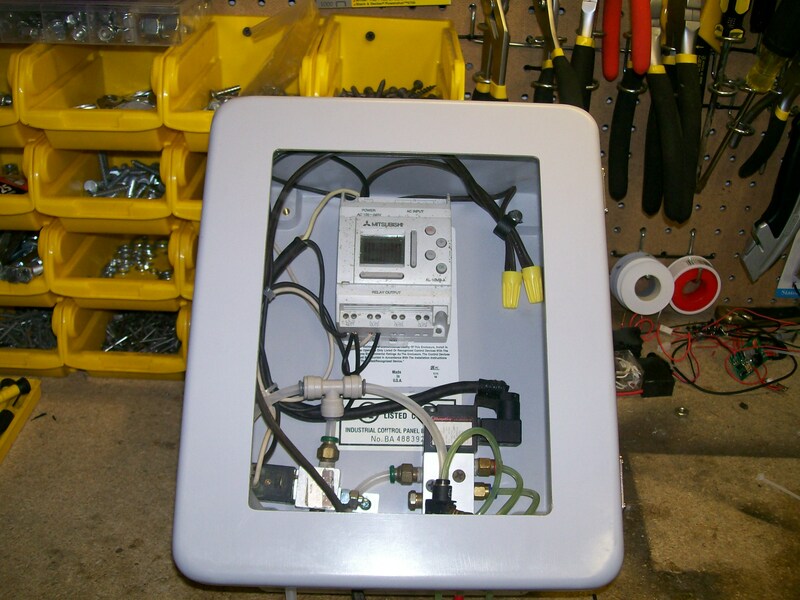 Complete with digital timer, amplified digital audio, pneumatic regulator, pressure guage and solenoid valve. Solid quality wooden construction. Height 10', length 4', width 3'. 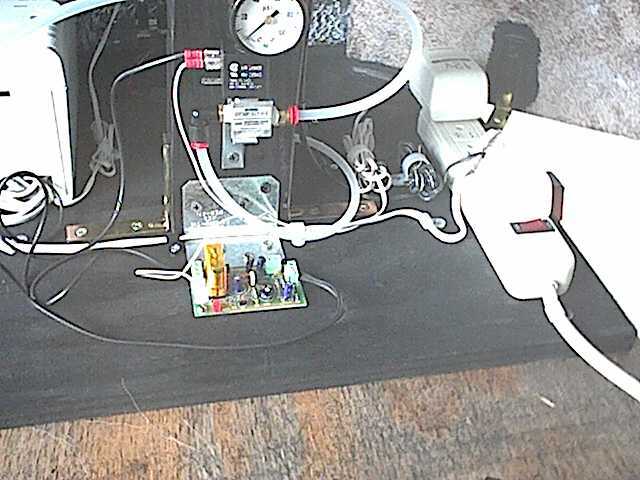 This animation is a pneumatic driven prop controlled by a digital timer. 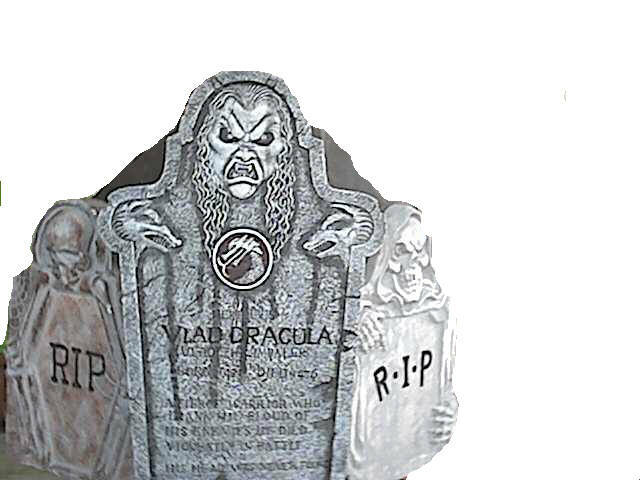 When activated via pressure mat or switch, the prop will thrust a screaming bust from behind a tri-layout set of high-qulaity hard foam tombstones. Complete with digital timer, amplified digital audio, pneumatic regulator, pressure guage and solenoid valve. 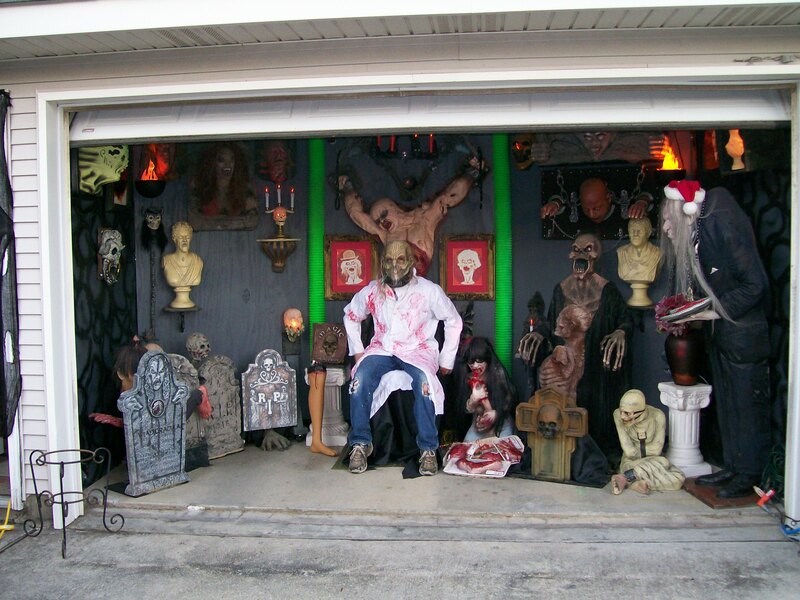 Nice touch to any haunt. 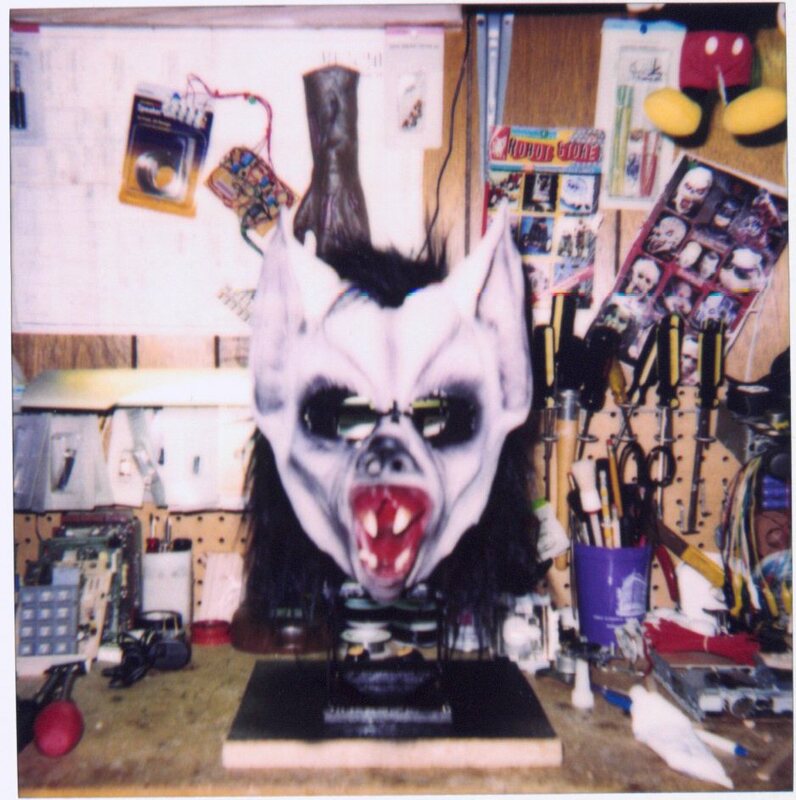 This animation is a pneumatic driven prop controlled by a digital timer. When activated via pressure mat or switch, the prop will not only rise up to 7 feet high, but will lunge 4 feet forward toward guests. Steel mechanism on a heavy wooden base. Has adjustable flow speed control. Operates on 120v and 50 PSI regulated. 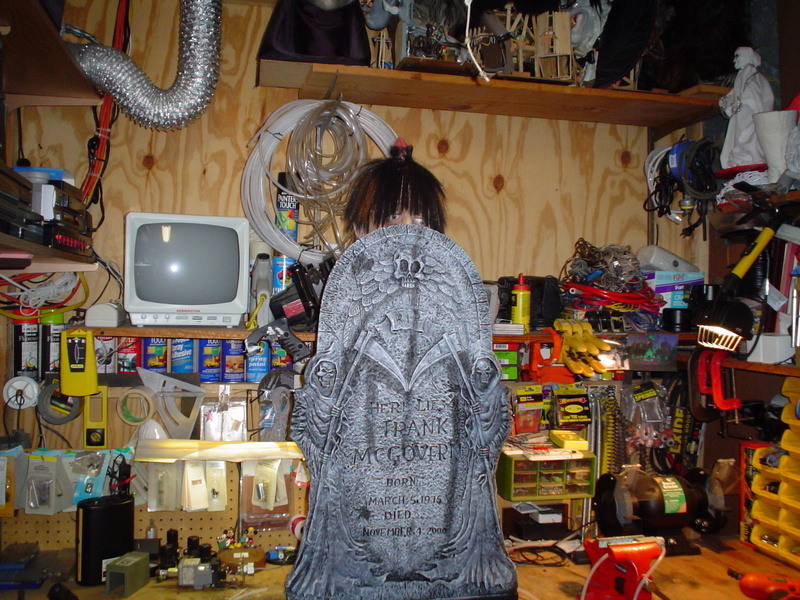 Use behind a tombstone, or sink into the ground. 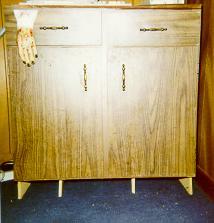 This animation is a wooden coffin with a built-in corpse riser mechanism. When a pressure mat is activated, the lid will open and slam shut a few times, then it will fully open. A corpse will then rise up with a loud wail, then will lay back down shortly before the coffin lid bangs open and shut a few more times. 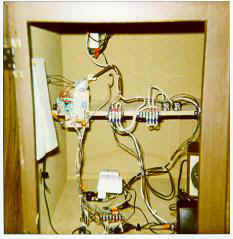 Controlled completely by PLC microprocessor and 50 PSI internally regulated. This is an animated piece of furniture which is digitally controlled by a PLC. 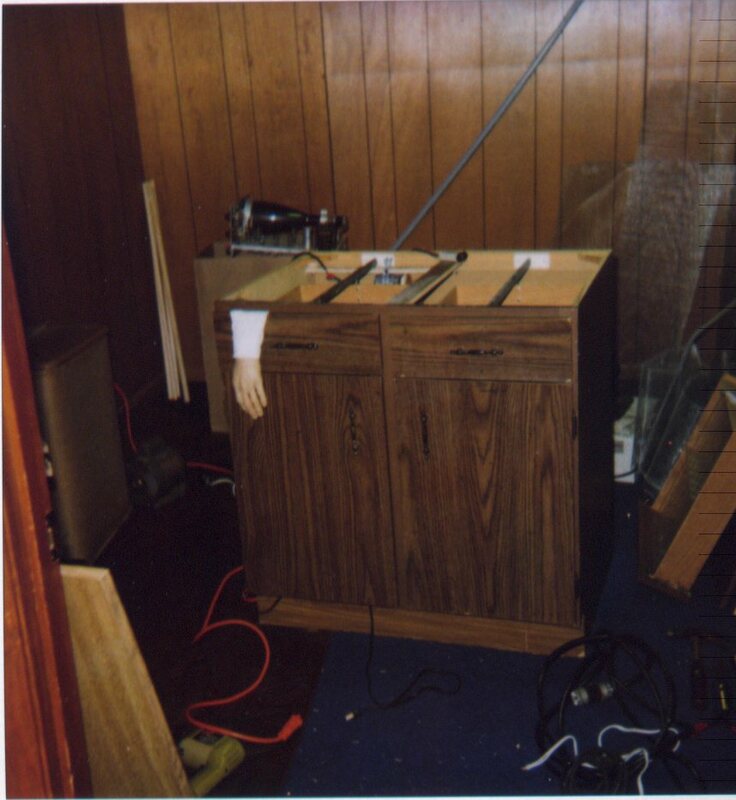 It has 30 seconds of animation which, when a pressure mat is activated, will open and close its front sliding doors dramatically, then the table-top opens and a corpseless head springs out screaming. 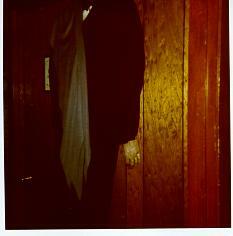 The head then retracts back into the table, and the doors slide open and shut frantically. 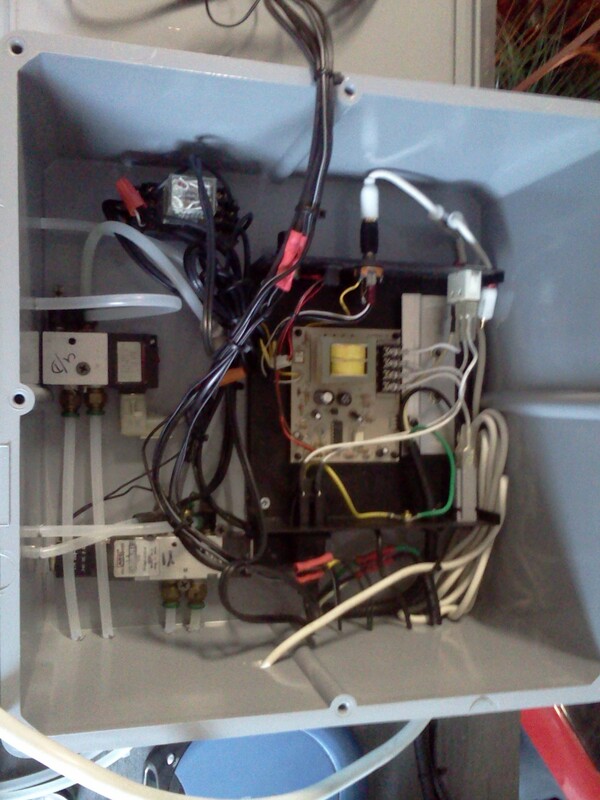 Runs completely off of 50 PSI internally regulated and a pre-programmed microprocessor. Show can be reprogrammed and changed with a PC and simple software. 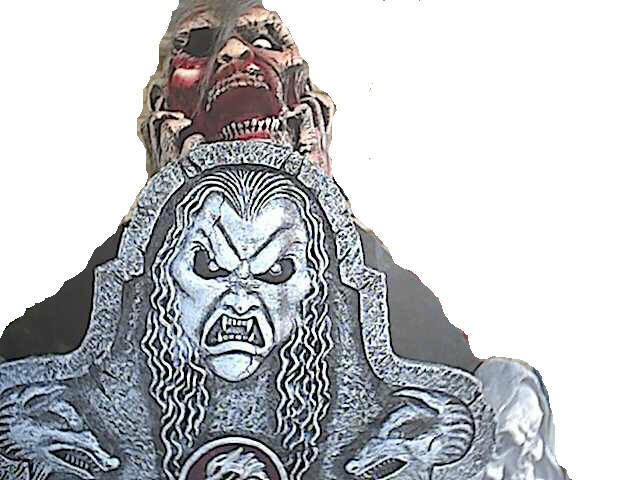 This is a full-bodied steel frame animatronic figure. It stands over 6 feet tall, and has full vertical arm movements. It utilizes our digital control system which is fully programmable. It contains a 6-valve block which can be fully adjusted to control speed of the armature movements. Weight is approx. 180 lbs. Great side-show piece. Needs 120V and 60 PSI air compression. 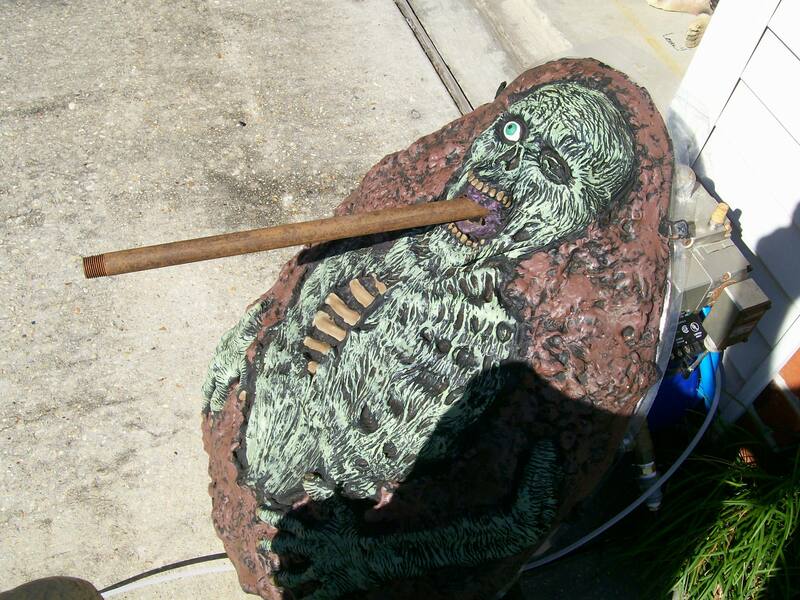 This prop will jump out at patrons when passed, giving a loud siren wail. It automatically resets and waits for the next patron. 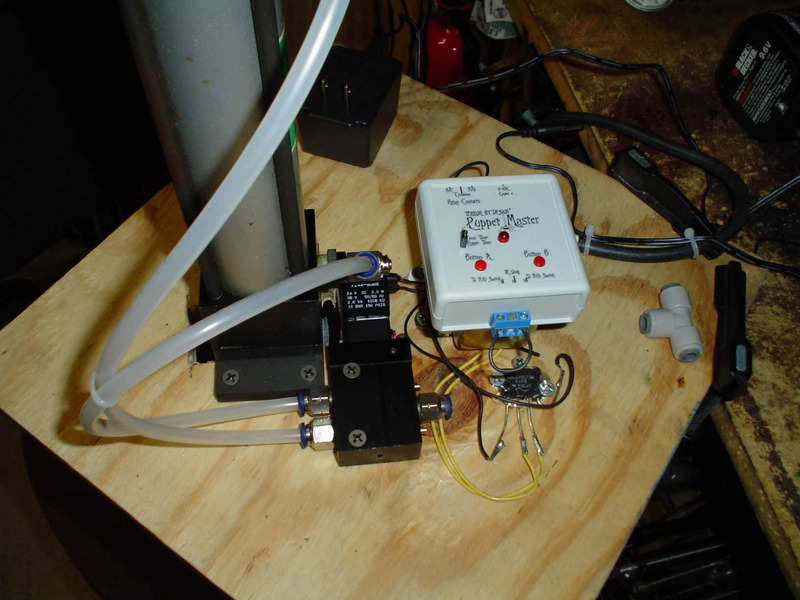 Pressure mat controlled timer and pneumatics. Needs 120V and 60 PSI air compression. This is an automated prop of a scary cat that horizontally lunges out at patrons. It hides inside a metal cage with the bars broken. 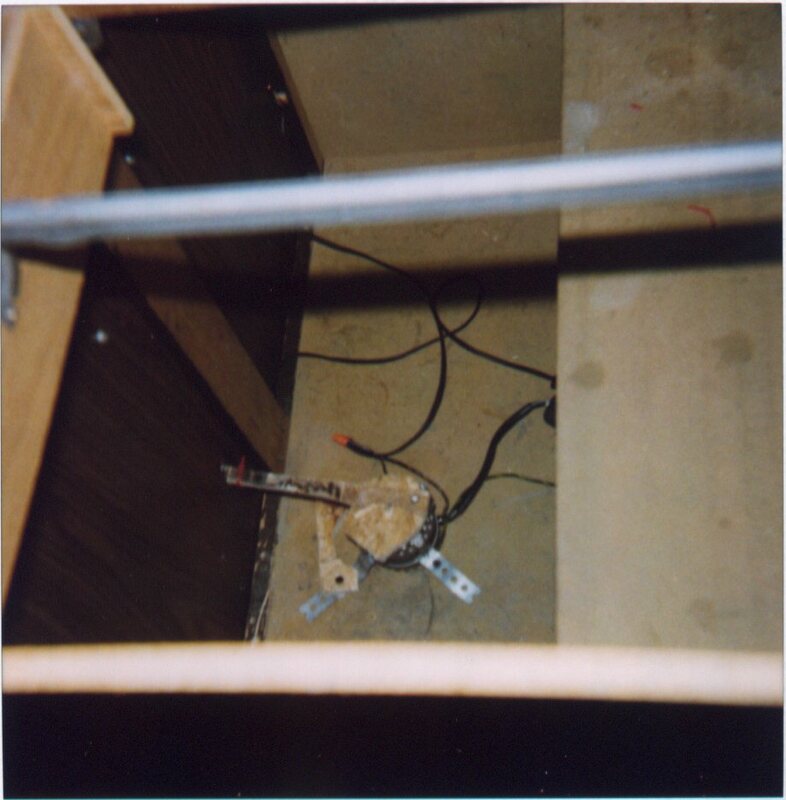 When a patron steps on the pressure mat, the cat lunges out horizontally at the victim, screaches, then returns to its cage and resets for the next victim. 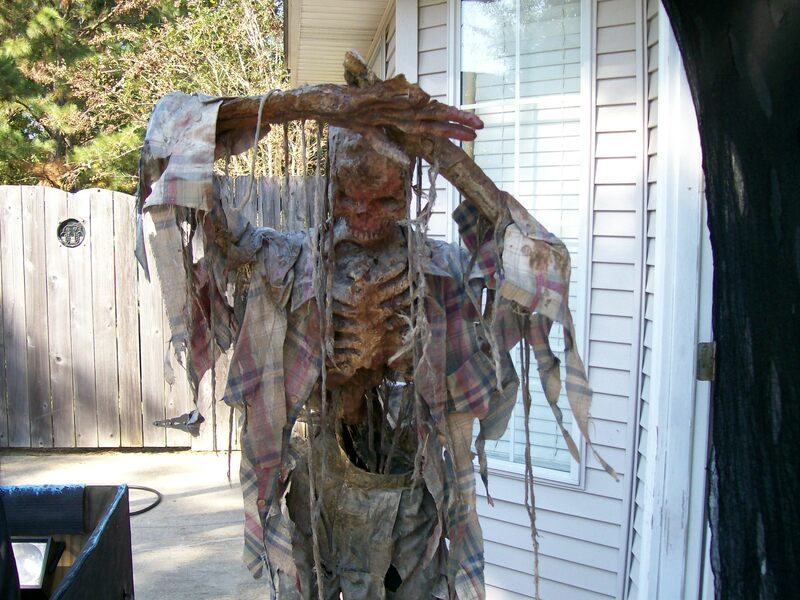 Awesome prop... very startling prop. Needs 120V and 60 PSI air compression. This is an industry-standard prop. 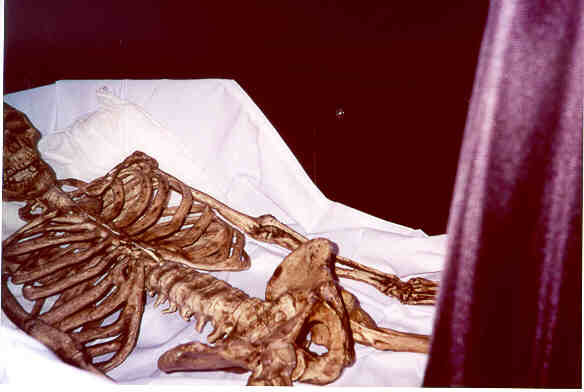 It consists of a mechanical steel tubing structure holding a full-body corpse split at the waist and housed by a wooden coffin. 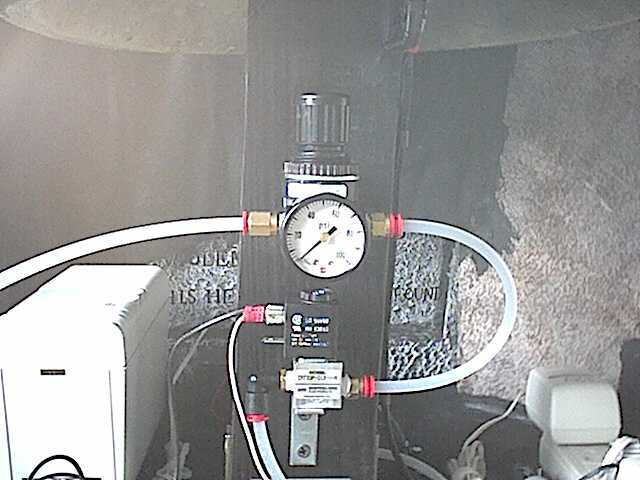 It is fully pneumatic and digitially controlled activated by a pressure mat. 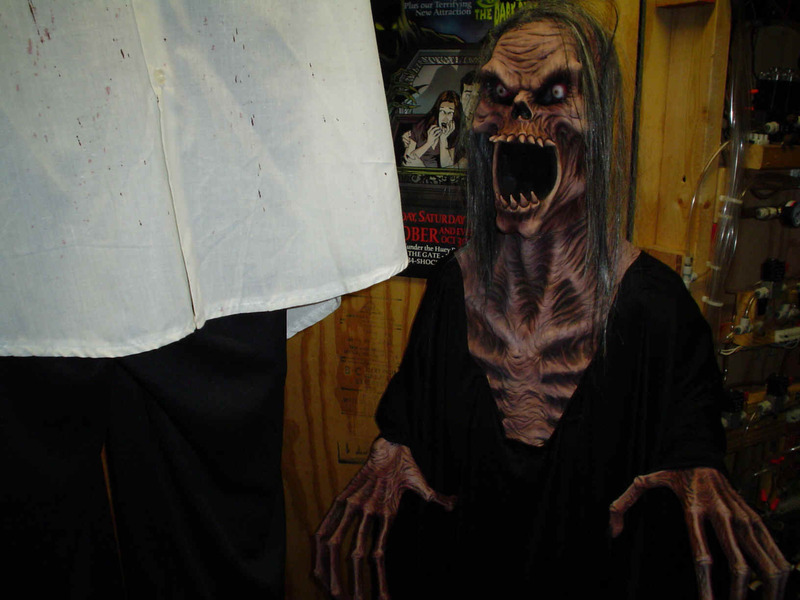 When the unsuspecting guest walks by and activates the prop, the prop is thrown from a lying position to a sitting position and extends its arms toward the crowd with a loud scream, then resets for the next victim. Awesome and surprising prop. Needs 120V and 60 PSI air compression. This is an industry-standard age-old prop. 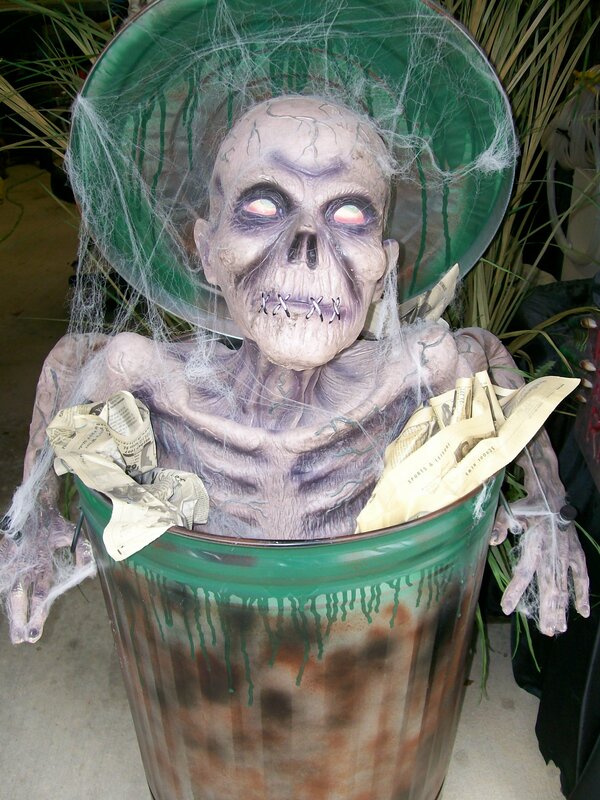 It consists of a mechanical steel tubing structure holding a half-body prop housed by a garbage can. 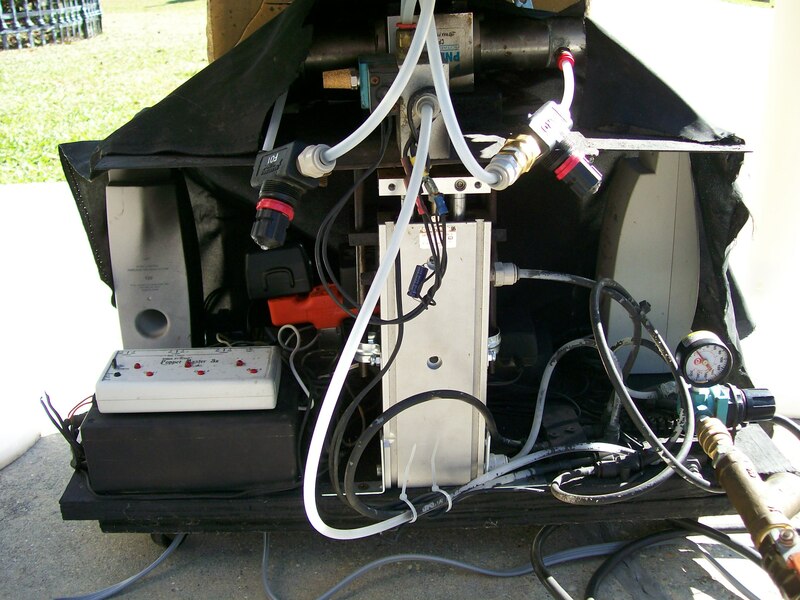 It is fully pneumatic and digitially controlled activated by a pressure mat. 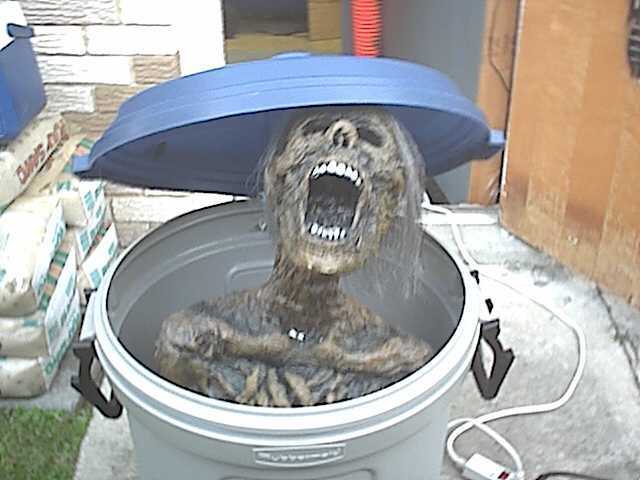 When the unsuspecting guest walks by and activates the prop, the prop is thrown vertically out of the can wielding a loud scream, then resets for the next victim. Awesome and surprising prop. Needs 120V and 60 PSI air compression. 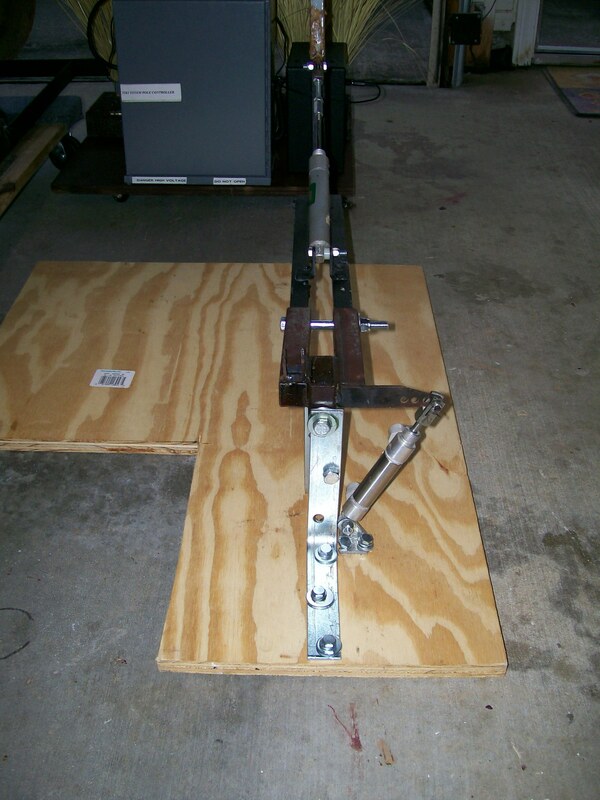 This large mechanism will throw a prop vertically to 7 feet high. It is built from steel tubing bolted and welded to provide maximum strength. It will throw a prop weighing 70 pounds with only 60 PSI ! 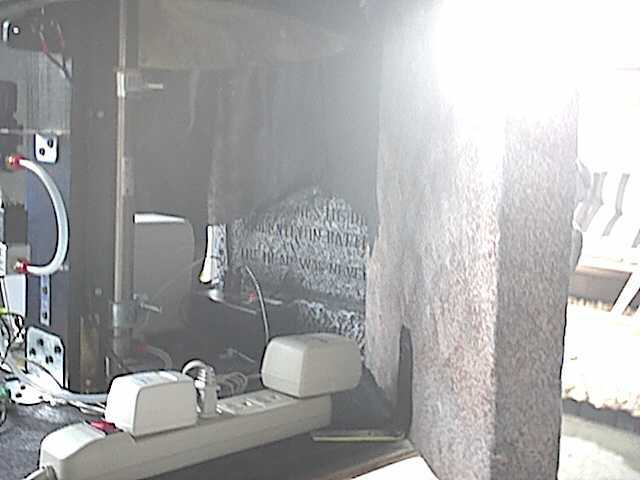 It is triggered by a pressure mat and digitally controlled. Very startling prop. Needs 120V and 60 PSI air compression. 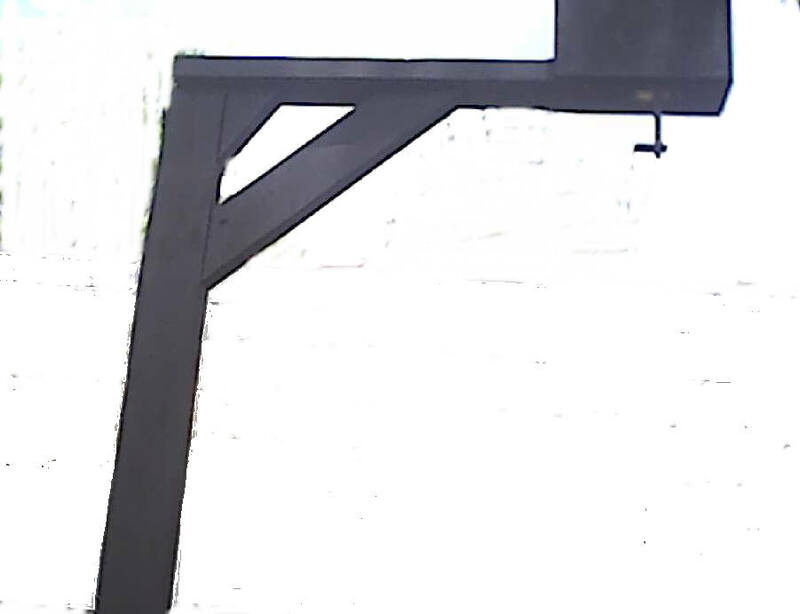 This large mechanism will throw and lunge a prop vertically to 5 feet high and 3 feet toward patrons. It is built from steel tubing bolted and welded to provide maximum strength.! 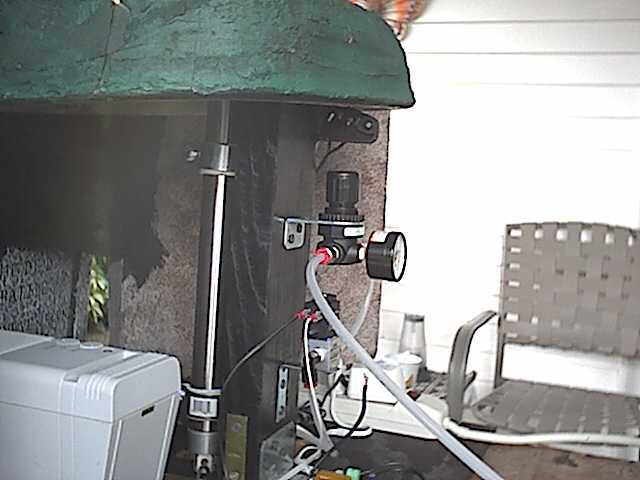 It is triggered by a pressure mat and digitally controlled. Very startling prop. 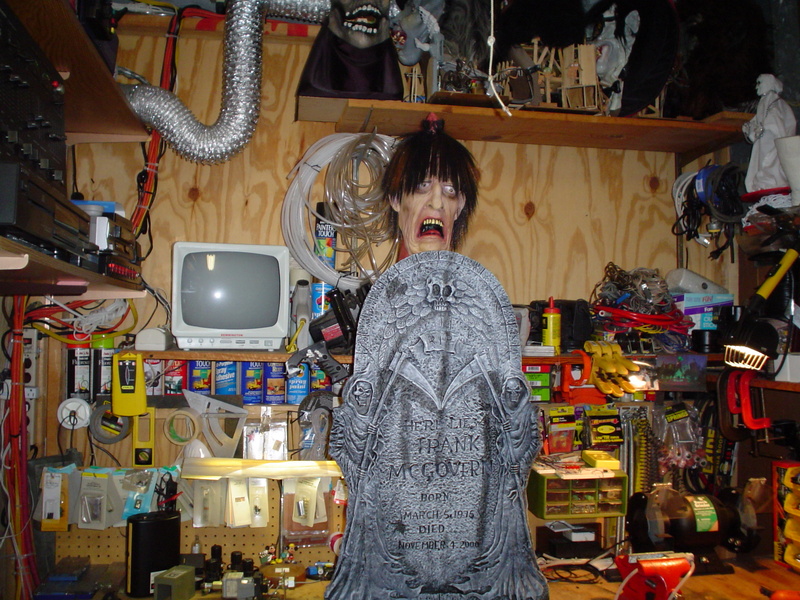 We've built an 8 foot coffin around this prop complete with pneumatic-operated doors. Needs 120V and 60 PSI air compression. 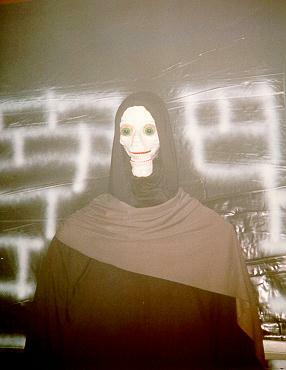 This puppet has moving hands, open/close mouth , and roving eyes all controlled by PC. Although he doesn't walk, he can sure give a HI FIVE !!!! Nice effect and awesome prop. 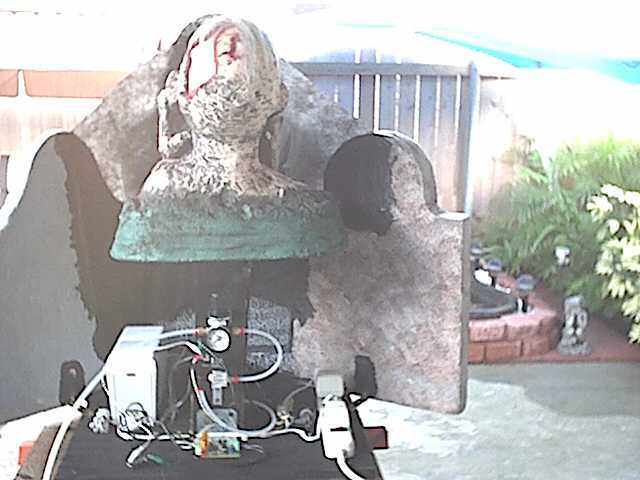 This prop has a head mounted inside a cauldron which pans back and forth looking at the crowd. 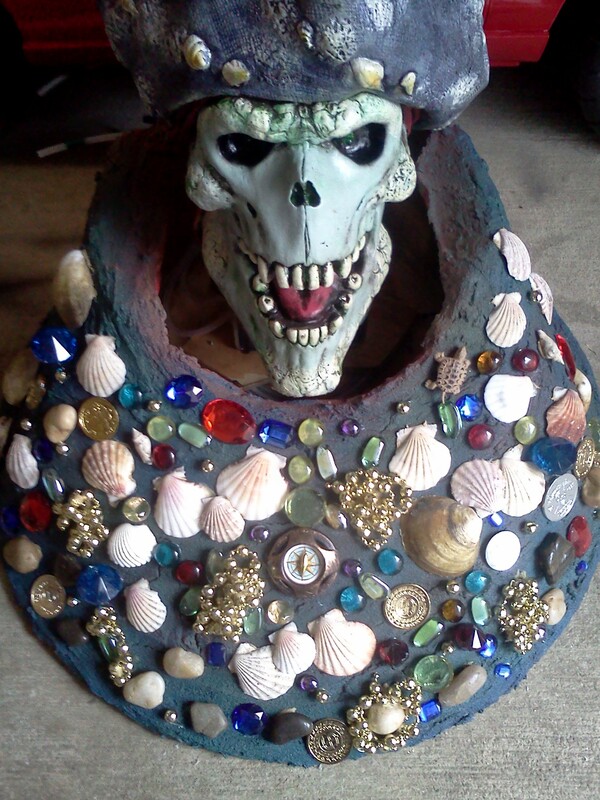 Here is the mouth for the Grim Reaper blow. This prop has independent upper/lower jaw movement. Click on thumbnail for a close-up. The prop hangs from the ceiling. Each hand will move independently causing a shaking effect. The head will turn, the mouth will open/shut, and the eyes will move left to right. 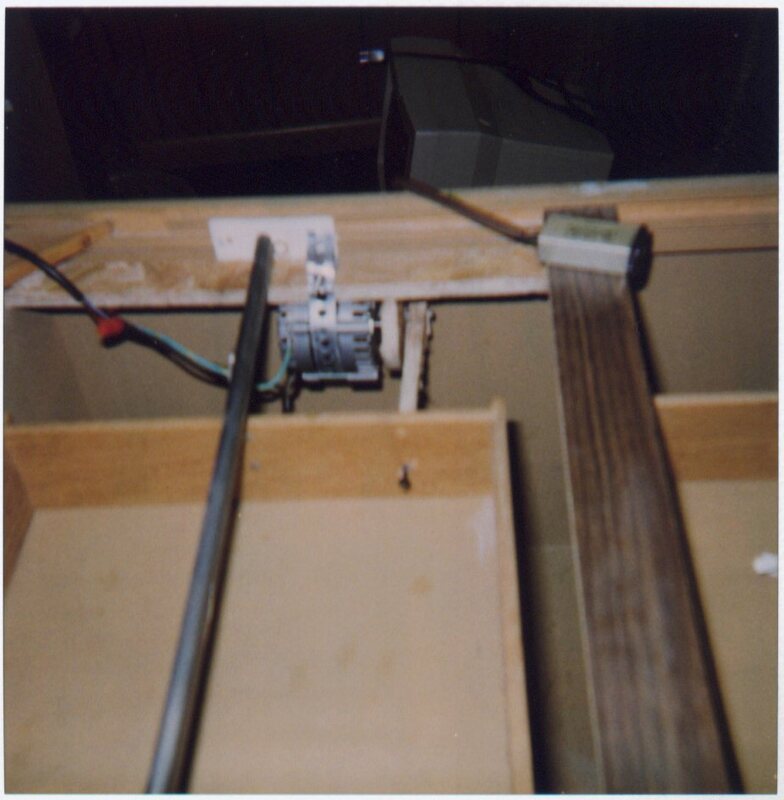 The door and drawer mechanics are accomplished by motors with an offset flywheel fitting on the motor shaft, then an arm is attached to the flywheel from the door or drawer. 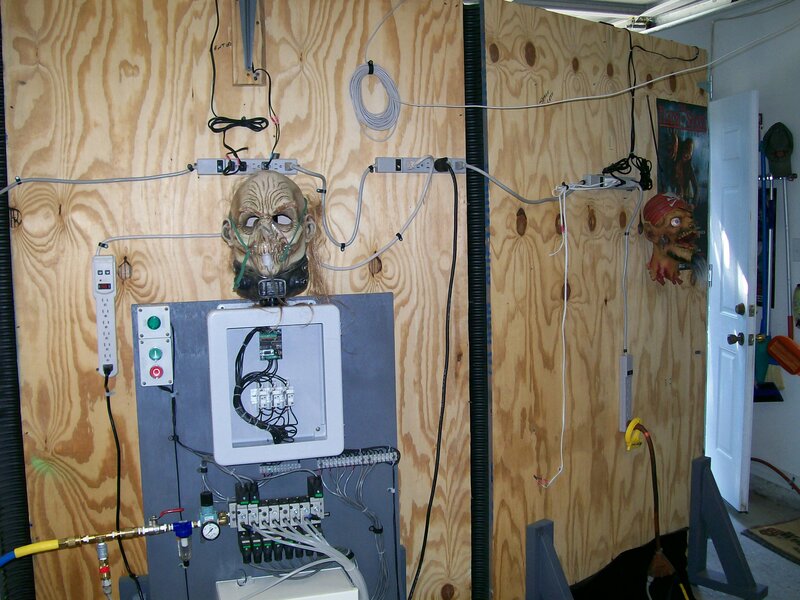 The motor is activated by a control circuit and creates a locomotive effect opening and closing the doors and drawers, as well as a sound-chip used to record and playback eerie voices of ghouls trying to escape from the cabinet. 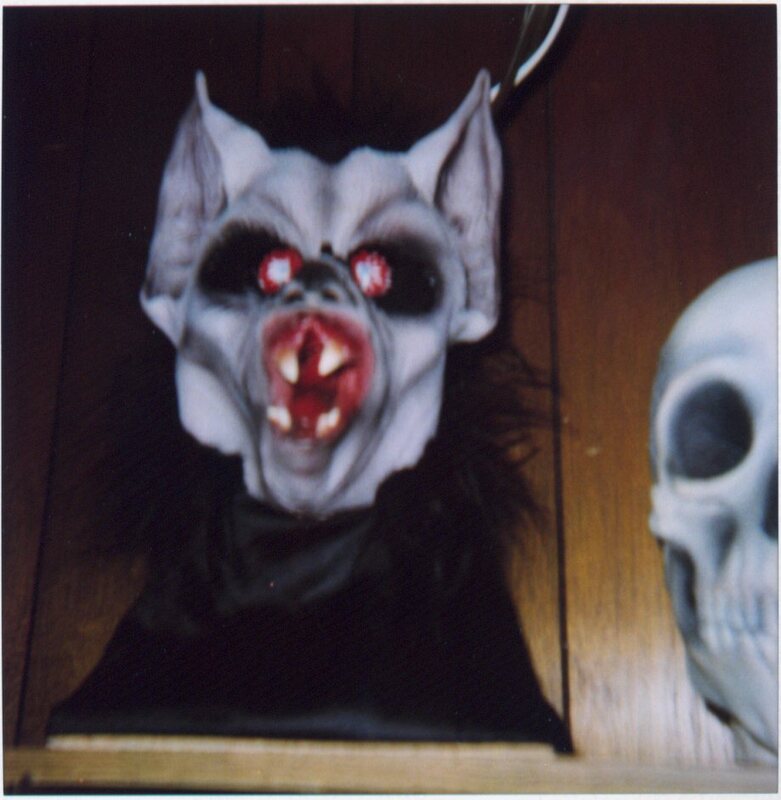 This prop was a smash hit for Halloween 98 & 99 & 2000!!! Finally completed, the prop was PC-controlled by a 486 MHZ pc running a GUI program created by us . 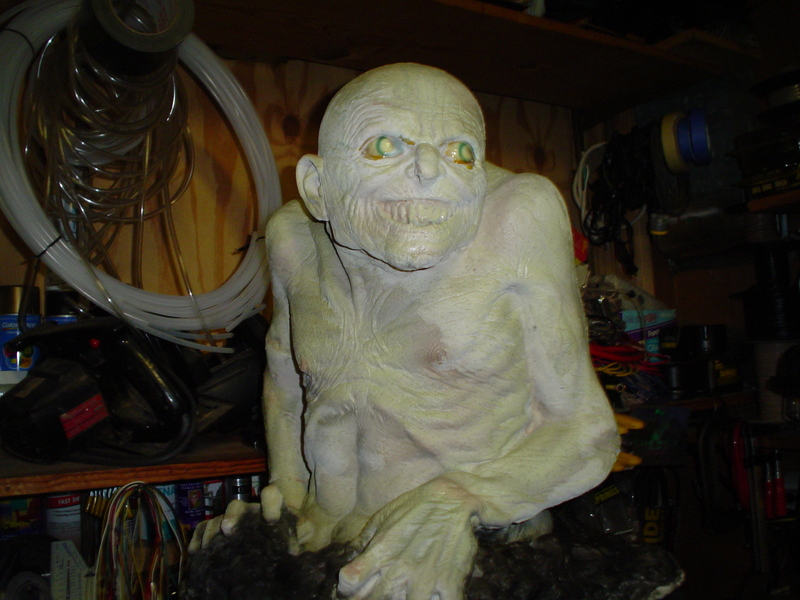 The program allowed our animators to time-control every aspect of the prop, from the drawer shooting out, and the door "clanging" open and closed, right down to the demons' voices trying to escape. What a hit!! 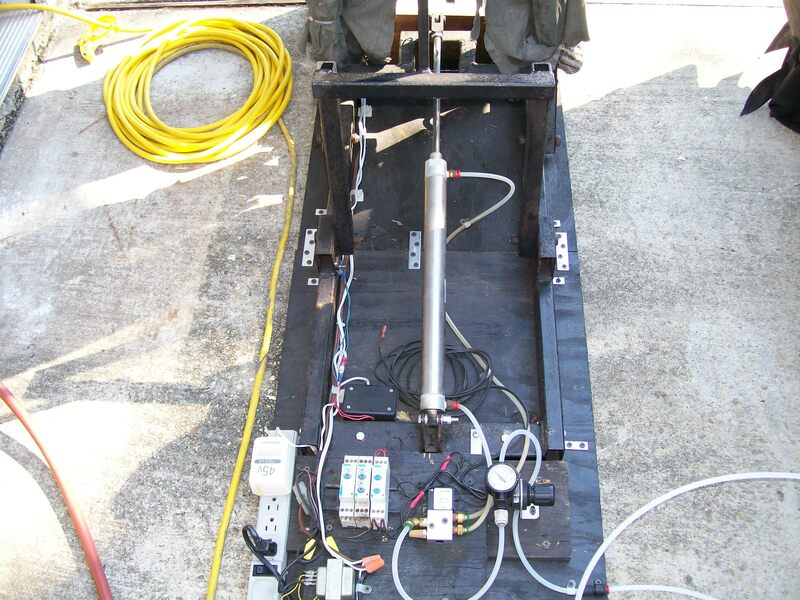 We recently completed a conversion on this prop from motor-driven mechanics to a pneumatic system. The doors are now operated by pneumatic cylinders controlled with a trigger-timer to set off the props movements. This is a computer-controlled pneumatic prop which "flips its lid" as guests walk by. The computer can control the amount of airflow through the piston to give it a "lifelike" haunting movement. This is a prop which needs no air nor needs a computer. Simply plug it in, and the head appears to "float" from side to side in random motion. 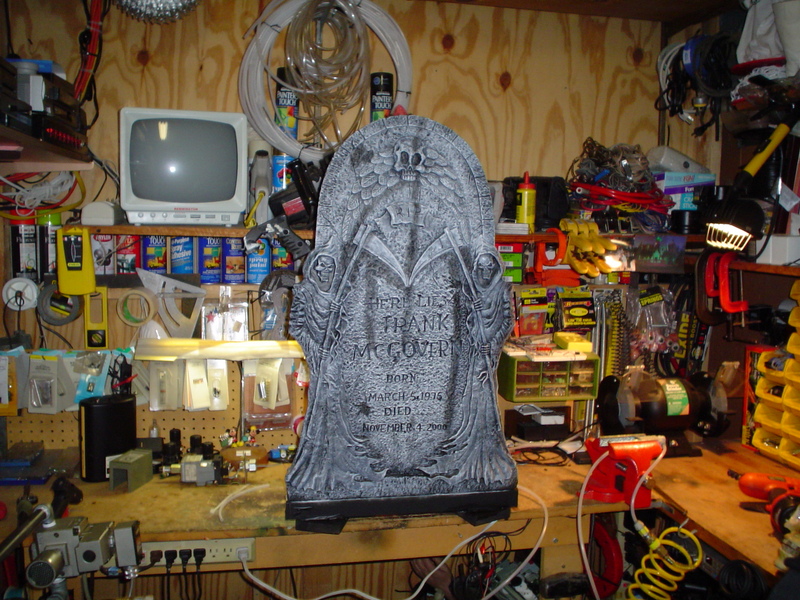 This prop is an inexpensive heavy-duty cardboard coffin "pneumatically inclined" whose lid opens and closes on computer-command at different heights and intervals. 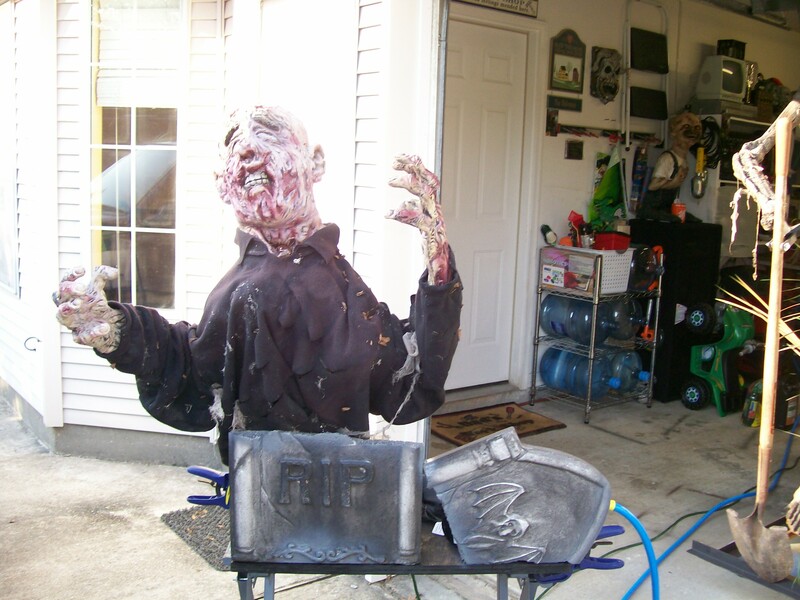 It contains a foam-filled latex skeleton, strobe light and sound effects. 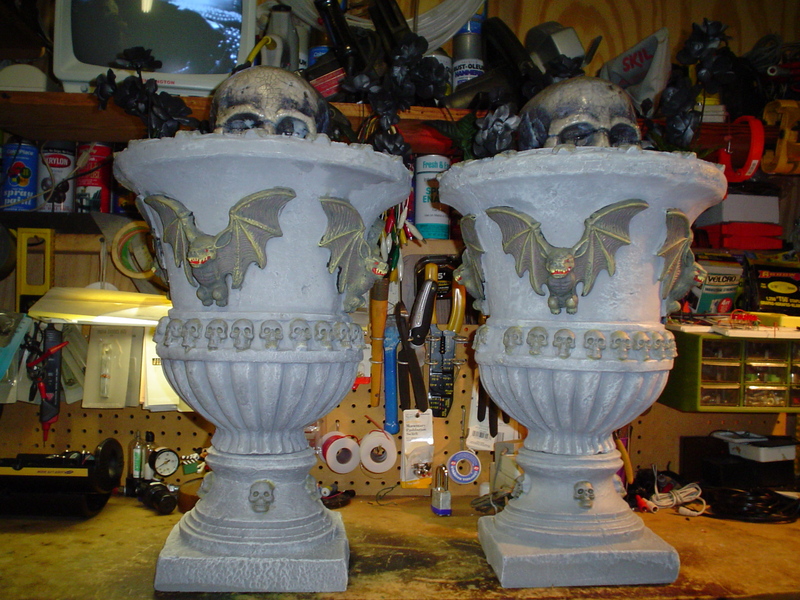 These small props are foam-filled latex heads mounted on a rod shaft attached to a pneumatic cylinder. It is activated by our own controller and software . 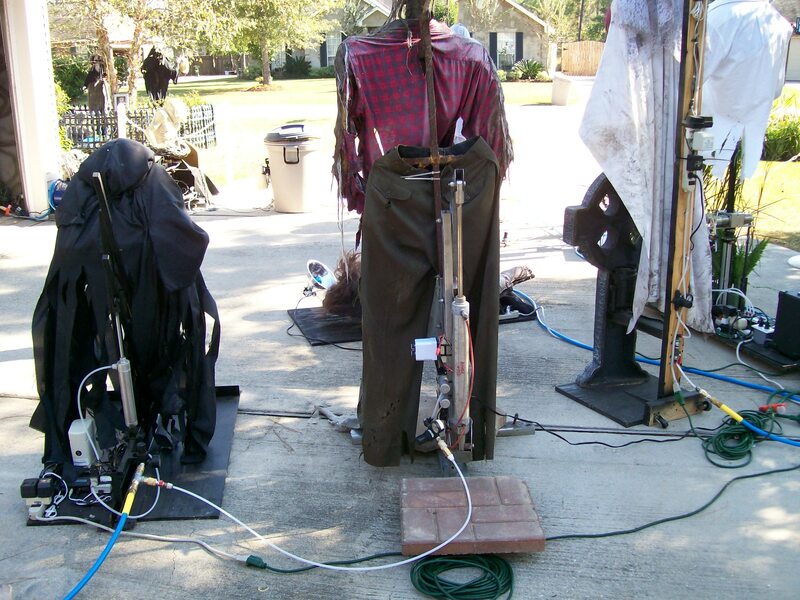 The prop rises vertically, screams, stays vertical for an adjustable amount of time , then resets and waits for the next guest to pass by. Very inexpensive to build and control.